With the 2012-13 season upon us, it is time to take a look at an offseason addition that everyone is anxious to see. 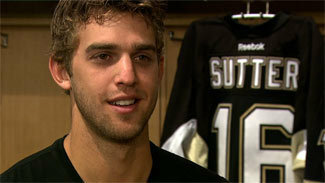 We would like to welcome Brandon Sutter to the Pittsburgh Penguins as he comes to fill the role of former-Penguin Jordan Staal. Following the news of Staal rejecting a $60-million, 10-year offer from the Penguins, it was only a matter of time until GM Ray Shero pulled the trigger on a deal. He brought in Sutter from the Carolina Hurricanes along with the #8 overall pick (D – Derrick Pouliot) and top defensive prospect Brian Dumoulin. On paper, this trade looks like a win-win for both teams. While Staal will be missed in Pittsburgh, Sutter can bring a comparable style of play and should thrive in a familiar role. Sutter broke into the league during the 2008-09 season, appearing in 50 games and only scoring a single goal (which just happened to be against Marc-Andre Fleury). He followed up his rookie season by posting career-highs in goals (21), assists (19), and points (40) while becoming a perennial fan favorite. His last two seasons have been consistent while averaging about 30 points. The statistics do not quite match up to Staal’s numbers, but luckily we do not have to rely on his offensive abilities with the return of Sidney Crosby, the reigning MVP Evgeni Malkin, and 40-goal scorer James Neal. The defensive abilities are what makes Sutter an excellent two-way forward and he often found himself matching up against opposing teams’ top lines. In Carolina, he was relegated to the 3rd line center position behind the likes of Eric Staal, Jussi Jokinen, and Tuomo Ruutu. He embraced the role, but it appeared as though he too, like Jordan, wanted a larger role. As a restricted free agent during the summer of 2011, Sutter rejected a long-term deal with the Hurricanes and instead opted for a 3-year deal ($2,066,667 per year according to CapGeek). The new atmosphere might be a welcome change for the 23-year old. Playing behind a juggernaut-like offense, sellout crowds every night, and the prospect of playoff hockey have to be appealing. If the Black and Gold game was any indication of what to expect, it appears Sutter is rising to the occasion as he finished with a goal and two assists. While the offensive production is notable, he should really impress this season with his defensive and penalty killing abilities. All signs are pointing to a great next two years for Brandon and hopefully even longer in Pittsburgh.